Many types of foot problems can be effectively treated by Prescribing and manufacturing a medical grade custom foot orthotic. Two of the most common, and painful foot problems are plantar fasciitis and heel spurs. Chiropractic manipulation, physical Therapy and foot orthotics are usually effective in treating it. Plantar fasciitis is an inflammation of the plantar fascia, a thick ligamentous/fibrous band on the bottom of the foot that is attached to the heel, and runs forward to insert into the ball of the foot. Plantar fasciitis is a painful inflammation of this ligament band, which usually occurs at its attachment to the heel; however, the inflammation and pain of plantar fasciitis can occur anywhere on the plantar fascia. A Heel Spur is a piece of calcium or bone that sticks out from the bottom of the heel bone, and lies within the fibers of the plantar fascia. When walking, the spur digs into the plantar fascia and causes small micro-tears in the plantar fascia. This produces inflammation and pain in the heel. At times, this pain may radiate into the arch. The chief diagnostic sign of these problems is pain in the bottom of the heel or arch when first standing in the morning, which gradually improves with walking. This pain may later return with continued walking. The pain usually subsides after a period of rest. Custom orthotics and foot exercise are usually effective in curing this problem. 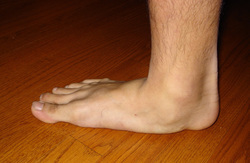 A bunion is a common deformity in the fore-foot. In order for it to form, ligaments and tendons which hold the bones and joints together must be more flexible than normal. This abnormal flexibility is usually the result of a biomechanical foot defect called pronation. • Wearing high heel and/or pointed toe shoes. These types of shoes apply abnormal pressure to the big toe and force it over toward the second toe; they also irritate the first metatarsal head causing a bump to form (when bone is irritated it enlarges). • An injury to the inner side of the foot or big toe may damage the first metatarsal / phalangeal joint, and speed up bunion formation. Patients that have a low arch or no arch commonly refer to their condition as flat feet or fallen arches. Fallen arches can cause problems such bunions, callus, corns, Achilles tendonitis, shin pain, severe heel pain, knee and ankle pain. The primary cause of an flat feet is over pronation. This can be controlled via insoles. People with flat feet or low arches who have been forced to live with back, knee and foot pain no longer have to put up with pain while standing, walking or running. Symptoms of Achilles Tendonitis include inflammation of the Achilles tendon accompanied by sharp pain behind the heel. This pain is often felt during the first few steps in the morning or after long periods of rest. Hammertoes the result of deformed toe joints, tight tendons that attach to the toe, and misaligned toe bones. The usual appearance of a hammertoe is a toe bent upward at the middle toe joint, so that the top of this joint rubs against the top of the shoe. The remainder of the toe is bent downward so that, instead of the entire toe bearing weight, only the tip of the toe bears weight. 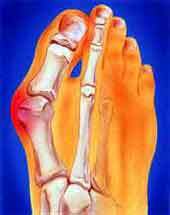 Pain can occur on the top of the toe, the tip of the toe or in both areas. Corrective Orthotics are usually prescribed to relieve shoe pressure and pain in these toes or to help the toe lie straight thus alleviating pain and preventing the hammertoe from becoming worse. 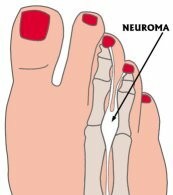 Morton's Neuroma is characterized by pain, numbness or burning in the forefoot, particularly between the third and fourth toes. Morton's Neuroma, like many foot-related pathologies, arise from a biomechanically unsound structure that has been subjected to excessively repetitive activity. Acute or chronic symptoms manifest as a result of varying levels of intensity. These symptoms impact at the most structurally unstable locations or the "weakest links" in the individual's kinetic chain relative to the repetitive activity. For example, excessive pronation, resulting from poor structural mechanics, can lead to plantar fasciitis, shin splints, or knee problems. All too often, excessive pronation is incorrectly identified as the cause of these problems, when in fact, as has been demonstrated, it is only a symptom. The real cause of the problem is the foot's inability to align, stabilize, and lock the arch structure prior to heel strike as influenced by restrictive footwear and exacerbated by rigid soles, heel height, and heel flare. Chronic compression or squeezing of the bones in the forefoot, caused by a restrictive toe box in ill-fitting shoes. Repetitive and excessive collapse of the metatarsal arch leads to compression and irritation of nerve fibers between the toes. 2. High blood sugar also affects the smaller blood vessels in the feet causing Peripheral Vascular Disease (P.V.D). This decreases the amount of blood, nutrients, and oxygen that are brought to the skin, fat, muscles, joints, and bones of the feet. This causes tissues to be reabsorbed by the body and it causes an inability to properly heal anything from small cuts to broken bones. To sum up, the diabetic foot is "at risk," even when the blood sugar is controlled. In my practice, I have found that Diabetic Custom-Made Orthotics will greatly reduce the risk of foot disease. These special orthotics act as a replacement for the thinning fat pad on the bottom of the feet, thus protecting the skin from excessive bone pressure. These orthotics will also gently support the arch and all the bones and joints of the feet. Our orthotics are made of durable, comfortable, space-age materials. They are lightweight, and will fit in most shoes. Custom-made orthotics are the diabetic's "ounce of prevention" that may eliminate a "pound of cure" later on.